If you've ever wondered why Italian meatballs have so much flavor, one of the secrets is the addition of Parmesan cheese. Preheat oven to 350� F. Spray a cookie sheet (with sides) using non-stick cooking spray. Gently shape meat mixture into balls (about 18) the size of a walnut by rolling a small amount of the mixture between your palms to form each one. To make forming the balls easier, dip your hands into cold water before you begin to shape each ball. Arrange in the prepared pan. 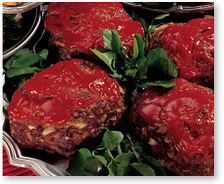 Bake 20 to 30 minutes or until the internal temperature is 160� F.
Heat 2 tbsp of olive oil in a pan or skillet. Arrange half the meatballs in the pan and cook until golden brown, about 5 minutes. Remove the meatballs to a serving plate. Add an additional 2 tablespoons oil to the pan and cook the remaining meatballs in the same manner. 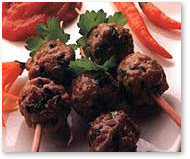 Serve the meatballs hot, warm or at room temperature. In a medium bowl, combine Atkins Corn Muffin Mix with chili powder, paprika, cumin, onion powder, and pepper. Blend well. Combine ground beef, beans, Atkins Mix with spices, and lime juice in a large bowl, mixing lightly but thoroughly. 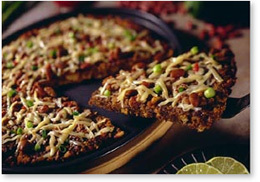 Spread mixture evenly in 12-inch pizza pan. Bake in 375�F oven 15 minutes to medium (160�F) doneness, until beef is not pink in center and juices show no pink color. Sprinkle with cheese; continue baking 2 to 3 minutes or until cheese is melted. Serves 4. 583 calories; 31g total fat; 19g total carbohydrates; 14g fiber; 57g protein. Eden Black Soy Beans are available from The Low Carb Connoisseur. Atkins Quick Quisine Corn Muffin Mix is available from netrition. *If you don't have, or can't get the Atkins Corn Muffin mix, you can substitute 1/2 cup vital wheat gluten mixed well with 1/2 cup finely ground almonds. Combine all ingredients except Brown Sugar Twin, yellow mustard, and sugar free ketchup. Mix well. Divide meat into 6 portions. Shape into small loaves. Place in shallow baking pan. Combine remaining ingredients. Spread over top of loaves. Bake at 350� F. for about 35 minutes. Makes 6 servings — Per serving: 182 calories; 14g total fat; 3.2g total carbohydrates; 1.8g fiber; 14g protein. You won't find a more Delicious Low Carb Chocolate Bar than Ross! Ross Chocolates will help you stick to your diet! All orders for 36 bars or more receive an automatic 15% discount. Start the new year right with a full supply for when temptation strikes! Use the coupon code NEWBIE and get FREE SHIPPING AND HANDLING for all first time customers who order just 1 Sampler Pack. Ross Chocolate Bars come in Almond, Supreme, Coconut, Cherry, Orange, Raspberry, Crunchy, Dark, Mint, and White! Taste-test results are in! 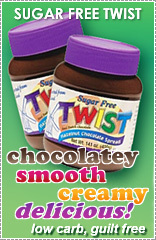 Read what your fellow low-carbers are saying about this chocolate! Try melting two of our Cherry or Raspberry Ross Chocolate Bars in the microwave; then dip cold fresh berries in the warm chocolate. 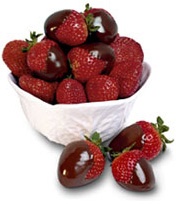 The cold berries will quickly set the chocolate and you'll have a low carb treat that can't be beat! 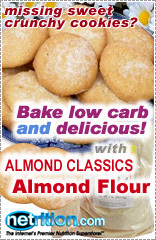 Visit our site for the best low carb chocolates in the world!